Who Do You Create Value For And Why? This is a guest post by my friend and classmate Rachel Wolan. I worked alongside Rachel in helping run the Berkeley Digital Media Conference, >play. Rachel is the founder & CEO of YadaZing – product maven, ex-Facebook and ex-SAY Media. She shares her thoughts in her blog and tweets at @rachelwolan. In every platform business, you need to solve the Chicken/Egg problem AND make sure that producers produce. On our platform, we are focusing on the underserved but small segment, English instructors. We give them tools to engage and interact with English students, the overserved but enormous segment. We are making a bet that our early adopters will be part of the 1% (of the 90/9/1 rule) who will create great content; this is our gateway to the 99% who consume the great content. Today we use reasons, Or do we? What is a predictor for a political candidate’s success? It is in the millions of tweets about the contest. What will get more customers to buy? It is in getting them to like your brand’s facebook page. How can you get your message across? It is by getting all your employees tweeting in unison. Ignorance of nature’s ways led people in ancient times to postulate many myths in an effort to make sense of their world. According to Viking mythology, eclipses occur when two wolves, Skoll and Hati, catch the sun or moon. At the onset of an eclipse people would make lots of noise, hoping to scare the wolves away. If you look at it Bigdata of these days is no different from what those Vikings in early days did trying to understand eclipse. Bigdata or not is defined not by volume (ok velocity, variety) but by our ability to process with tools at our disposal and how advanced our mind and reasoning is. It is not farfetched to say, our early ancestors when bombarded with cosmic data saw that as Bigdata problem, trying to make some sense out of it with myths. Today we use reason, mathematics and experimental test—in other words, modern science. Today we have no scarcity of data, we have abundance of it – billions of tweets, facebook updates, instagram pictures – all volume, variety and velocity. Do we really use reason, (right )mathematics and experimental test to make sense of this social media noise? May be Hawking is true in case of science but not in social media science, data science or in so called science of marketing. If not would be seeing any of those statements we saw in the beginning of this article, propagated as “scientifically proven” methods and retweeted by millions? This is a story with two threads. One about Chipotle’s recent announcement that it will increase prices and the other about its hit Scarecrow video and associated iPad game. I will bring these two together to show you the excellence in pricing and how any content marketing activity must help serve this pricing purpose. The decision to raise prices has nothing to do with how your current profits are growing. Their reason for this price increase? You guessed it, costs. Nicely done, as we have seen before. And the stock market reaction? The bid up the stock, showing confidence in this better price realization. I want to make sure you see that the food costs are used only as plausible reasons to help customers digest the price increase. Let us look at its current food costs and its share of revenue. Their 2013 third quarter revenue was $827 M and food cost was $277 M. Purely for financial accounting purposes their percentage gross margin is 66.5%. As you can notice they are not just scarping by, trying to grab last morsel of cilantro rice from the bottom of Burrito Bol. That means they did not set the price based on food costs to begin with and hence to say they will increase prices because of food costs is just effective messaging. That is one half of the pricing story. Say costs increase twice as fast as inflation, by 4%. On average 3% to 5% price increase will recoup them if demand did not drop. How can they make sure the demand does not drop? The other half is making sure customers continue to pay $8.20 for a burrito and feel good about it That requires investing in the brand and making customers feel great and hip about the brand. That is served by their Scarecrow video. Content marketing experts jumped on the incredible view metrics of this video to draw their own lessons about telling stories, talking about bigger picture etc. But think about the ROI on such content marketing effort. Imagine yourself going in front of CEO for an ask for running a content marketing campaign. Social media experts may convince you to ignore ROI and focus on, you got it, “the bigger picture”, “return on engagement”, “share of conversation”. This brutal metric is the only way to know if a marketing initiative is working. The second cold truth is that almost nothing works. It is all about tying the bigger message and stories to price increases they can pass through without any associated demand drop. As you chomp down your spicy sofritas you feel good about being part of a bigger story and hardly even notice the price increase. All those feel good stories are for naught if you cannot tie it back to ROI in the form of increased prices without drop in sales. Who does your pricing and content marketing? during that all-important phase when you’re grasping for ideas, dim light appears to be a catalyst for creativity. “Darkness changes a room’s visual message,” the researchers explain, and one such message seems to be it’s safe to explore widely and let your imagination run free. moderate level of background noise creates just enough distraction to break people out of their patterns of thinking and nudge them to let their imagination wander, while still keeping them from losing their focus on the project all together. This distracted focus helps enhance your creativity. Before you give a second look to these studies, despite the fact that these are published in peer reviewed journals and found statistically significant difference, stop and ask some critical questions. Are the effects additive? So would it work better if we roamed about in dim coffee shops? The ambient noise study reports difference between 50dB and 70dB. How many other pairs did they test and reject before reporting on a pair that had statistically significant difference? (See green jelly beans cause acne). Only those sound levels that showed difference get reported and the rest get filed in the round filing cabinet. And journals like publishing only those studies that find statistically significant difference. Remember that when motivated researchers keep looking for something interesting they are bound to find it. What is the measure of creativity? Is that correct and relevant? The ambient noise study used Remote Associates Test while the dim light study used Creative Insights Problem. Why two different metrics by the two studies? Did they try all kinds of measures and picked the one that showed statistically significant difference? If you repeated the Dim Light experiment with Remote Associates Test and Ambient Noise experiment with Creative Insights Problem will the results hold? Let us say all these are answered in favor of the tests. Does that mean the results translate into real world that has far too many variables? How many hidden hypothesis did the two researchers took for granted in coming up with their results? How many of those will be violated in the real world? Does statistical significance mean economic significance? What is the economic impact of any perceived difference? Do you have means to measure creativity of your team that are based on real life results and do not involve administering Remote Associates Test or Creative Insights Problem? Performance in tests like these is rarely an indication of actual job performance, as Google found out about brainteasers in job interviews. Don’t forget opportunity cost. You see here two recipes for improving creativity, you will find more if you look for them. All peer reviewed, I bet. Which one can you afford to pick? Or could you be investing your time and resources in something else instead of dimming lights and creating coffee shop noise? Even if you go on to dim lights or create coffee shop noise there is always Hawthorne effect. Either your team will react to it, tell you that they are seeing improvement or you will convince yourself you are seeing improvement because you do not want to be wrong about your decision to pipe coffee shop noise through office speakers. Finally it behooves us to keep in mind the great academic fraud of Diederik Stapel. I am not saying anything remotely close to what Stapel did happened in these two studies. But I am urging you to start with high skepticism and place the further burden of proof of applications on the researchers and on those writing derivative works based on the research. Your opportunity cost of internalizing these studies and acting on them is far too high. You don’t want to bump into other Salon readers wandering in dim and noisy hotel lobbies. If you want an excuse to get your work done in a coffee shop, do it. But do not try to justify it with scientific reason. Finally, if you are allowed to believe in only one of the two studies which one will you believe? Give the text in this picture a read. 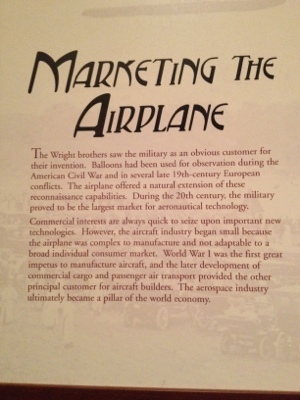 Clearly Wright brothers had it all wrong – starting with customer segment, choosing one that not only had a pressing need but also had the budget to pay for it and charging for the product. Had they made it free for all, after all the marginal cost is $0, they could have built a community of billions of users and could have easily monetized them by selling extras like baggage fees and drinks. Even if only a small percentage of them paid for extras, remember that small percentage of a very large number is still a large number. All flying is social. It is not that difficult for you to see that an airplane is really a communication platform disguised as a transportation app,I mean, device. What is worse than a meaningless Social Media metric? The answer is, meaningless social media metric presented in the form of a infographic. And it comes to us via MediaBistro from, not Social Media Gurus, no not witch doctors, and if you guessed Social Media Scientist that would be a good guess but not correct, because it comes from SocialBakers. If you have not figured out the flaw in the metric (shown left) or you are one of those 311 people who tweeted the link, I will try to point out the problems with bakers’ recipe. What does this really mean in the context of your marketing spend? What is the marginal benefit from a change in this metric? What is the cost of moving the AER, if at all one could? Are the AERs of Facebook, twitter etc additive? Well keep asking as you are not going to find any such answers from the eye candy infographic. First the units of this metric. It is stated as a percentage. And percentages are? Dimension less. The numerator at best is a dimensionless ratio and at worse has a complicated unit of Interaction/Activity. The denominator has units of number of people – fans, followers etc. In other words the ratio is not a dimensionless quantity because you are dividing a quantity that is NOT number of people by a quantity that is number of people. So how can anyone simply multiply this number by 100 to state this as a percentage? Like Baker’s Dozen, they should call this Baker’s percentage. Second the ratio is specifically designed to show as low a value as possible and hence the possibility for improvement and potential sales. The numerator is divided by total number of followers (or fans) a brand has. So larger the number of followers, smaller the magical AER. The thermometer in the infographic tells us the maximum any brand currently has is 0.7%. This also explains why they chose to multiply by 100 and call it a percentage. Otherwise, 0.007 would look too awful for anyone to pay attention. Third, this is indeed genius move in targeting, after all those brands with millions of followers likely have higher marketing spend and hence are likely to divert some of it to improve their measly AER. There you have it, yet another pointless and wrong Social Media engagement metric, presented as a stunning infographic that not surprisingly found many takers. Final note, if you are tempted by any of the social media engagement metrics that talk about anything except dollar values you can cure that temptation by reading Ron Shevlin‘s book Snarketing 2.0.